Every bride is different, but most newly engaged people know that there are certain things that need to be taken care of before the typical wedding can take place. If you find yourself in a situation where you’re wondering what to do first, you’re not alone. Your Denver wedding and event planner Blue Linden has first-hand experience in this department, as we specialize in making sure all things on the to-do list are taken care of before you set foot down the aisle. There is no right or wrong place to start, so we’ve put together a list of the 4 most popular firsts to help you find what is most important to you. The most popular answer to the what to do first question is theme, which encompasses picking style and colors, too. People feel that once the theme is set, it allows a much smoother transition into checking off other wedding planning tasks like time of year (and the exact date), a location and venue, the decorations, bridesmaids and groomsmen attire, and the flowers. Where the wedding takes place is one of the most popular wedding planning tasks that is checked off the list first. If you live far away from the majority of the people you’ll be inviting, you may decide that taking it back to your hometown is the best choice. If those you want to attend are scattered all over, you might consider a destination wedding instead. Choosing a location/venue that offers vendors in a package will help complete other items on the to-do list and make planning go much more smoothly. 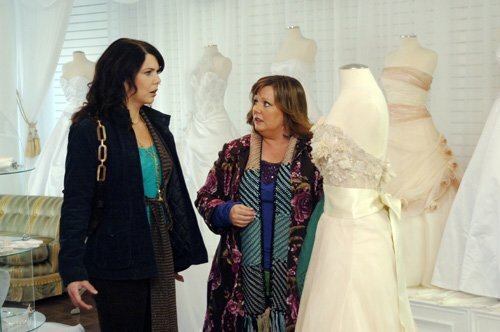 If you’re anything like Lorelai, then your first wedding planning to-do was all about the dress. The fit/style of the dress can help determine the season and the venue, which can then impact the flowers and potentially a theme. Once your theme is set you can choose invites and decorations and… you get the idea. Maybe there’s a specific date you want to memorialize. Perhaps your busy work schedules only allow for a certain time where you can both get off. Or it’s possible that you just randomly selected something that sounds good (his birth month with her birth day). Having the date as the first wedding planning to-do you select can be helpful in setting your budget, narrowing down your location/venue, and choosing a theme/style (which is often impacted by the time of year). We also want to say that a smart first wedding planning to-do is hiring a wedding planner/coordinator like your Denver wedding and event planner Blue Linden. Not only can we help you decide what to do first, but we can help with all of the wedding planning tasks on your plate. That being said, what is first up on the to-do list for you? What wedding planning tasks are highest priority to you? Do any of the above suggestions appeal to your planning process and answer your what to do first question? Share your thoughts and feelings with us below, by connecting with us on our social media platforms, or contacting us in person - we love hearing from you!